Lucky Pants Bingo - 100 Spins on Lady Luck Deluxe! Players claiming the above offer will not be eligible for the standard 300% + 100 free spins or 100% slot bonus 1st deposit offer. Happy Monday LBB'ers! We have a special treat for you! Deposit a minimum of £10 using promo code SPIN99 and your account will be credited with 99 Free Spins instantly. On top of that, you can also use promo code Monday for a 10% Games Bonus of up to £100, 10 Bollywood Bonanza Free Spins, 10 Dragon Scrolls Free Spins and 10 Love from London Free Spin. The deposit bonus promotion is open for all depositing players. The promotion code Monday can be used twice on Monday. Check your account to see if you received your share of our £500 Bonus Drop. In total, 100 players received a £5 Games Bonus. You can use the code twice today! Deposit using code ALOHA100 and receive 20 Free Spins for every £10 deposited, up to 100 Free Spins. Free Spins can be used on Starburst, Aloha! Cluster Pays, Fairytale Legends: Hansel and Gretel The Legend of Shangri La: Cluster Pays slot games only. Not available to players depositing using NETELLER or Skrill as a payment method. Available to existing players and once per person/account on first deposit. 10 Free Spins on Love From London. Play with £50 on Gala Spins! Bonus valid for 7 days (bonus removed). This offer is available from 30th November 00:00 to 4th December 23:59 (UK Time). Visit promotions section at Lucky Pants Bingo's website and look for ADVENT TREATS – DAY FOUR! Max. win from Free Spins is £15 for VIPs and £5 for all other players. Any wins from Free Spins are playable on Exclusive Slots for VIPs and on Bingo for all other players. Make a £10 first deposit using code FINN to claim 50 Fair Spins on Finn and the Swirly Spin. Fair Spins are no ordinary Free Spins. Fair Spins come with the guarantee of NO wagering requirements. You keep what you win. Claim before midnight, Wednesday 6th December. Only available to existing bgo accounts and once per person/account on first deposit. 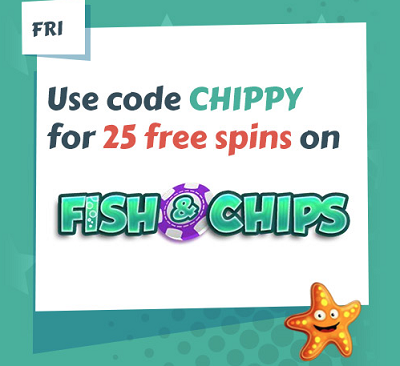 Deposit today a minimum of £10 using code CHIPPY and you will receive 25 Free Spins on Fish and Chips! Promotion available on Fridays only. Code CHIPPY required with a qualifying deposit. Maximum 25 free spins per player per day. Deposit a minimum of £10 with code MERRY for 20 Free Spins on Very Merry Christmas slots. Promotion available between 00:00 – 23:59 on Monday, December 25, 2017. £10 minimum deposit and code MERRY required. Hi LBB'ers, do you love a good mystery? Crack the Case on Wintingo and you will receive Promo Codes that will unlock Spins! This promotion runs from 01/08/2017 to 01/11/2018 23:59 (GMT+2). Hi LBB'ers! Every week from January 8th until February 4th, 2018, 23.59GMT, you can win a share of 8,000 Free Spins on the Sharknado slot game. Players can win a share of the weekly free spin amount based on the amount they have deposited over the week. The deposit must have been wagered at least once to qualify for the free spin credit. The credit will take place on Mondays (15th, 22nd, 29th January and 5th February 2018). The free spins given to players are based on their total deposits made within one week, Mondays to Sundays. Players who have made the same deposit amount will share the total amount of free spins. For example, if 100 players have deposited £5 each of them will receive 6 free spins for that week. Winnings generated from the free spins which were granted based on the deposits made of £74.99 and below are capped at £2.50. Winnings generated from the free spins which were granted based on the deposits made of £75 and above are capped at £5. The deposit bonus promotion is open for all depositing players January 12th 2018, 23.59 GMT. Play your favourite games with 10 Free Spins! - Visit the cashier every Tuesday. - Tick “I have a promo code” option. - Deposit using code TUES.
More T&Cs on bingo website. 20 Free Spins on Unicorn Bliss. For more details visit Zoe's Bingo website.